The PXLmmn is a knife which comes with a maroon micarta handle but which also comes with a handle nail notch that differentiates it from the maroon micarta model. As with other PXL models, this is a slightly larger than usual folding knife which is intended for everyday use with a modern and yet classic design. It carries the EDC label which means Every Day Carry. The blade is made from a stainless 3G laminated powder steel which has a hardness of HRC62 which also means that the steel is pretty much indestructible. 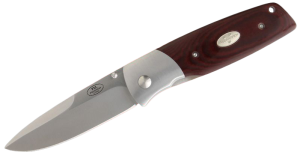 The handle is the classic maroon micarta and is very sturdy and can be used in several circumstances. The knife comes with a safe and strong liner bladelock that allows you to close and open the blade in one swift movement and with just one hand making it useful for those who are either right handed or left handed. The PXLmmn also comes with a strong and removable clip that offers a safe, comfortable and extremely fast access to the knife. You obviously have to note that the PXLmmn knife is a high precision instrument so it should be handled with care. The handle nail notch is also a pretty useful tool allowing for maximum dexterity. Since some countries outlaw the fast opening folding knife mechanism, Fallkniven are offering the knife with traditional nail notches on both sides of the blade. With an overall length of 7.83 inches and a blade length of 3.46 inches, you can rest assured that the PXLmmn performs extremely well in all sorts of situations with a sharp blade and maximum manoeuvrability. The Black cordura sheath which comes with the knife ensures that it is kept safe and sound while moving around.